Living in Japan, baseball fan Kohei Nirengi is anything but typical. Approximately, 95 percent of his collection consists of American major leaguers. 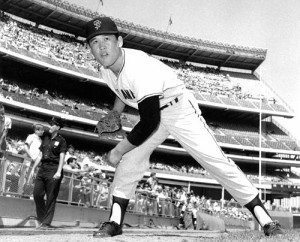 He had reached Masanori Murakami years ago, wanting an autograph because of the pitcher’s Jackie Robinson-like fame in being the first Japanese barrier breaker to reach the majors. Helping add such touches in translating David Patton’s words, Masanori Murakami included an additional response to questions. Q1: Are you a Giants fan? Q2: I would be interested in hearing of your favorite memory of your U.S. playing days. I asked the humble Kohei if he was prepared for other collectors clamoring for his skills. His answer? Kohei has contacted Murakami again. Kohei’s charities of choice have been his local animal shelter and Japanese organizations aiding tsunami and earthquake survivors. He’s asking the fabled pitcher what charities he supports, in hopes of the two of them combining on a private signing to help causes they both favor. Kohei assures me that BBTL readers will be among the first to learn of the details of how and when such an opportunity could happen. Please, add a comment below if you’d be interested in Murakami’s autograph while aiding Japanese charities. Coming Monday: Do all TTM collectors include a SASE? What happens when someone doesn’t? Diamondbacks pitcher and collector Brad Ziegler explains. Getting a Masanori Murakami autograph would be a great opportunity to add to my limited collection of Japanese cards and players. I’d certainly be interested! I would love to add Murakami’s auto to my collection too.